Nike's new $250 shoe that makes a faster runner might be cause for celebration, but it plays into a long-running debate over the deeper meaning of the marathon and who should participate in it. The Vaporfly 4% is just the most conspicuous example in the arms race underway to engineer pace-enhancing shoes. 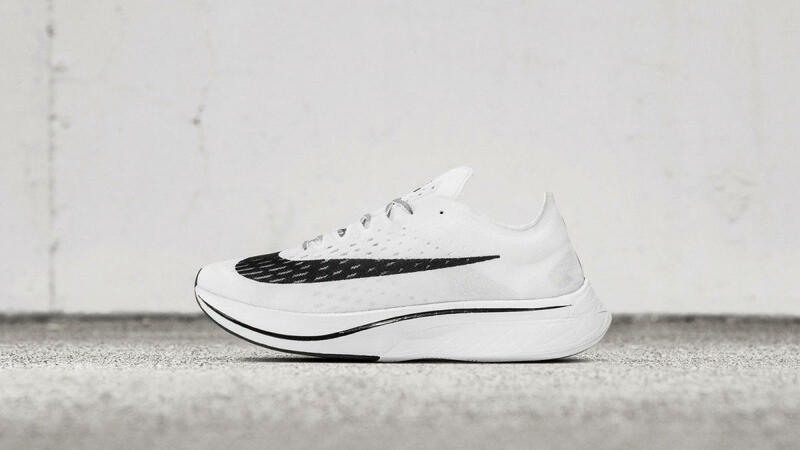 In 2014, Nike introduced a revolutionary new shoe—the Vaporfly 4% (NVF)—that promised faster marathon times. Even more boldly, the company claimed that the shoe&apos;s cutting-edge design could result in an elite runner doing a sub-two-hour marathon. In September of 2018, Kenyan Eliode Kipchoge came as close as any runner has ever come to proving Nike right. Wearing a pair of fresh Vaporflys, he obliterated the world record of 2:02:57, running the Berlin Marathon in a remarkable 2:01:39. Does Kipchoage&apos;s accomplishment suggest that Nike&apos;s grand claim was more than a marketing ploy? A new study suggests the answer might be yes. Writing in the journal Sports Medicine, Kyle Barnes, an assistant professor of movement science at Grand Valley State University, and his co-author Andrew Kilding, from the Sports Performance Research Institute in New Zealand, found that the shoe alone makes a runner faster—just as Nike specified, by about 4 percent. A $250 shoe that makes a faster runner might be cause for celebration. But it plays into a long-running debate over the deeper meaning of the marathon and who should participate in it. 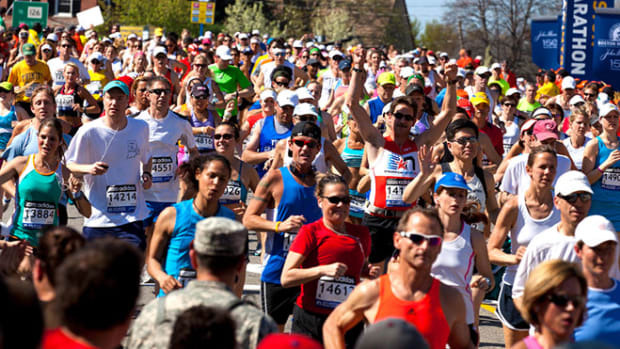 Since the 1970s, marathoning has transitioned from an elite activity to a common experience. 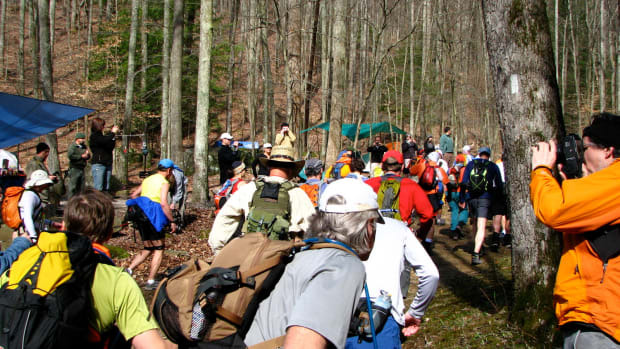 As the event has grown in popularity, some runners have started to lament the divide between "real" athletes and the plodding hoi polloi who clog water stations and do something old-school runners find anathema: walk. Does the NVF threaten to exacerbate this divide? The study&apos;s methodology was straightforward enough. The researchers had 24 highly trained runners do four five-minute trials on a treadmill, wearing a different shoe for each interval. In addition to the NVF, runners sampled track spikes (Nike&apos;s Zoom Mutumbo 3), traditional marathon racing shoes (Adidas Adizero Adios 3), and an altered NVF weighted to equal the traditional running shoe. As runners ran at several different paces, Barnes and Kilding measured overall oxygen uptake (VO2 max), rates of oxygen uptake (VO2), carbon dioxide production, and other biochemical indicators. Results were unambiguous: NVF improved running efficiency by 2.6 percent compared to the track spikes, 4.2 percent for the standard running shoe, and 2.4 percent for the weighted standard shoe. Barnes notes that, while the ultimate reason for the shoe&apos;s effectiveness isn&apos;t exactly known, he adds that a lighter shoe, in addition to the carbon plate built into the NVF, reduces "the inertia of a leg swing" which, in turn, reduces the energy expended. Bottom line: This shoe, by sheer virtue of its design, makes a runner go faster. 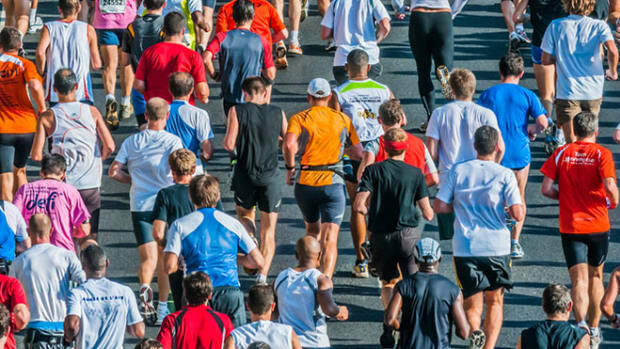 As a technological innovation exclusively dedicated to improving pace, NVF takes a clear side in the growing divide in marathoning&apos;s relatively hidden culture war. At the risk of oversimplifying, there are two types of marathoners: those who care about their time and those who care about finishing. The two groups do not always share the road peacefully. As an ambition, running a marathon has undergone a radical democratic transition over the last 50 years, one that has favored the finishers. Back then it was the province of an elite clique of young, competitive, mostly male runners. Wining, placing high, and running fast mattered. Today, while the sport remains stubbornly white and comprised of the economically well off, it has opened its ranks to women (10 percent in 1980; 40 percent in 2010), older runners (44 percent over 40 years old), and, alas, slower runners who just want the medal and a photo of their finish. This last group has, over the last decade, come under fire by faster non-elite marathoners (let&apos;s say runners who finish in under four hours) who object to the growing size of marathons (30,000 to 40,000 runners is not uncommon) and the replacement of "runners" with "participants." They long for the golden days when, during the early miles of a race, they didn&apos;t have to weave in and out of throngs of slow runners and walkers to run their race at their pace. This opposition to "slow" marathoners is especially explicit on runner forums. A comment such as this—"a better name [for "slow runners"] would be running poseurs. They buy all the stuff, come to the events, and look as if they&apos;re participating, but they don&apos;t really try, and in the back of their minds they smirk at those who do"—are standard. In the comments section of a place such as the Denver Post the tone is a bit more measured, but the message is equally overt. Under the pseudonym "Slow Runners Get Out of the Way," a reader writes, "The problem isn&apos;t slow runners per se.... However, they need to get out of the way.... Slow runners clog the start, clog the water stations, and in many cases don&apos;t follow established race etiquette." These attitudes are hardly isolated expressions of crankiness. According to Sean Ryan, race director of the Green Bay Marathon, "There is a push-back at these events from the long-standing participants; they lose interest in the event because of the size of the crowds." Defenses of the "participant"—the entrant who runs slowly (say 13- to 15-minute miles), walks, and could care less about a marathon time—are, as you might imagine, staunch and impassioned. 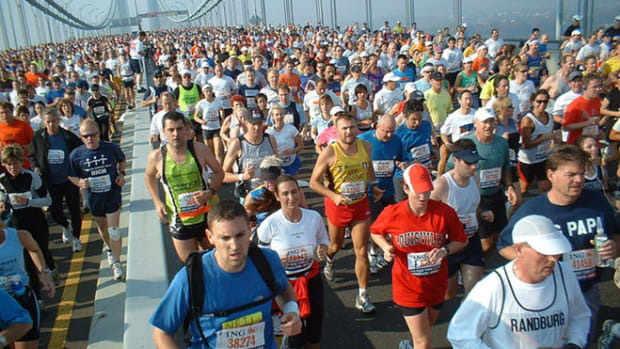 Advocates of the ambling amateur highlight the rare inclusiveness of marathons. What other sport, after all, do the worlds&apos; most elite athletes participate in the same event with the most casual duffer? It is in this spirit that many marathon websites are beginning to list walker-friendly marathons, marathons with high cut off times, and marathons with the most walking participants. The Vaporfly 4% is just the most conspicuous example in the arms race underway to engineer pace-enhancing shoes. From the Reebok ZigTech to the Adidas Energy Boost to the Brooks Adrenaline, shoe companies are marketing the message that speed matters. As these shoes increase in popularity, the more powerful the backlash against the casual marathon runner will become, and the greater the likelihood that more and more "elite only" marathons—such as Boston—will result. 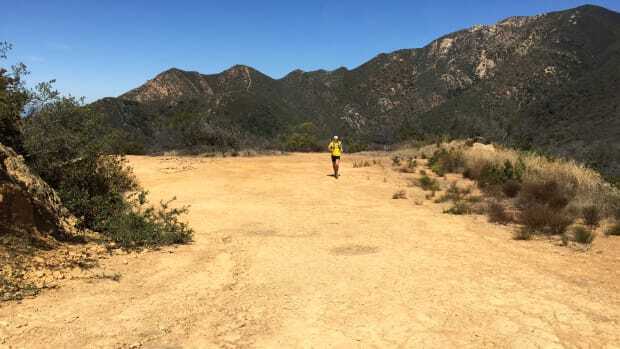 Ultramarathon running draws a particular type of athlete—one who has plenty of free time, doesn't mind pain, and is also white. 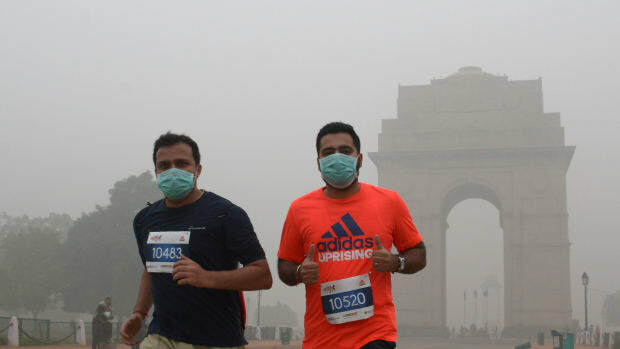 In New Delhi, a group of runners used an assortment of gear to run a race through an air quality crisis that blanketed the city in smog.